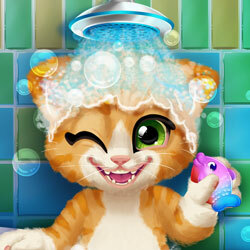 Description: Rusty's an adorable tabby kitten who now needs your help to take a bubble bath! Clean up the adorable little kitten and then blow dry his hair and powder him up. Make sure you select some adorable outfits so he can have a great day of playing outside!